MELBOURNE, Australia—NW Group recently bolstered its lighting inventory with state-of-the-art Martin by HARMAN lighting fixtures, provided by Show Technology. In order to stay ahead of the curve in the live concert and touring markets, NW Group decided to upgrade its already impressive inventory of lighting solutions with new additions from Martin. With help from local supplier Show Technology, NW Group expanded its arsenal of industry leading solutions with MAC Aura XB and MAC Quantum Profile fixtures. “We’ve used Quantum Wash, Viper and Aura fixtures with great success for years,” said Graeme Whitehouse, General Manager, NW Group. “We were in the market for next-generation fixtures that could deliver rapid movement and beautiful color mixing during high profile stage performances. After testing numerous fixtures with local supplier Show Technology, we decided to go with Martin MAC Aura XB washes and MAC Quantum Profiles. We’re extremely happy with our choice—the Aura XB and Quantum Profiles enable us to provide even more value to our clients in the arts and entertainment world as well as the corporate arena. As we’re now expanding into “in-house” venue services, such as Brisbane’s iconic City Hall, we’re continuing to demonstrate the versatility of these fixtures,” said Graeme. Apart from being a lightweight, compact LED wash light, the new MAC Aura XB integrates new features, improved brightness, a newly refined color mixing system and an optimized lens design which produces tighter beams and more balanced washes. The MAC Aura XB’s highly efficient performance and patented Eye-Candy Aura Effect helps NW Group provide visually impressive lighting rigs without requiring a lot of AC power. 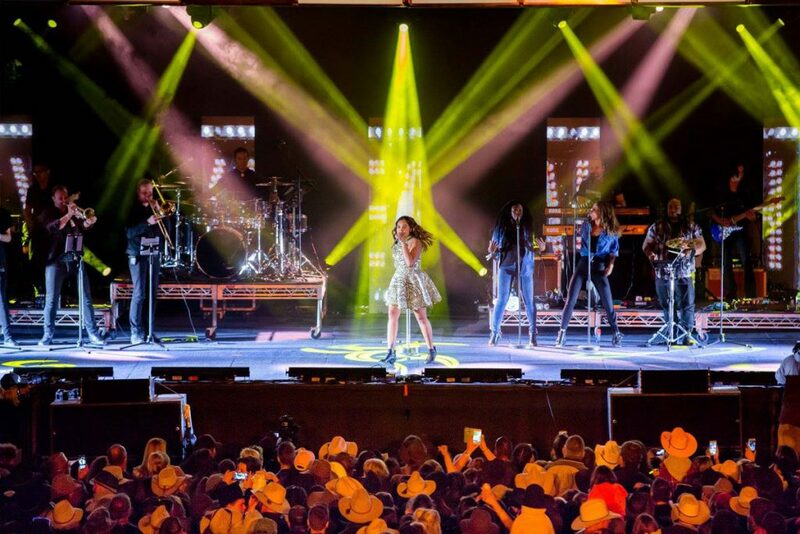 In addition to new MAC Aura XB fixtures, NW Group purchased a number of new MAC Quantum Profile fixtures to provide events with high-quality white light, smooth CMY color mixing and crisp mid-air projections. The MAC Quantum Profile also enables NW Group’s team to utilize Martin’s trademark Animotion™ FX system and produce extraordinary beam animations and stunning gobo projections. NW Group’s new MAC Quantum Profile fixtures enable them to achieve a mix of breakup gobo, aerial and beam looks to enhance any event. The team at NW Group was especially impressed with the fixture’s speed of motion, rich palette of colors and consistent photometric performance via LED technology. Additionally, NW Group is pleased that their new Martin products offer easy rigging, intuitive configuration and exceptionally reliable performance under the harshest conditions.